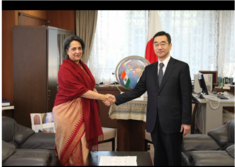 India and Japan on Friday signed two strategic agreements in Tokyo to enhance and strengthen the India-Japan strategic and global partnership. 1. 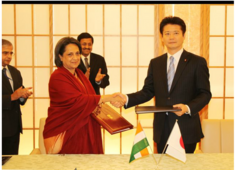 An agreement over Indo-Japan Social Security was signed by the Ambassador of India to Japan Deepa Gopalan Wadhwa and Japan Foreign Minister Koichiro Gemba. A memorandum between the Department of Atomic Energy of India and the Ministry of Economy, Trade and Industry of Japan was also signed on cooperation in the rare earths industry in India. According to the agreement, Japan can now import rare earth minerals from India, which will reduce its dependence on China for materials to produce hi tech products. 2. 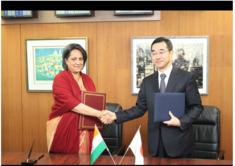 The second deal was signed by the Ambassador of India to Japan Deepa Gopalan Wadhwa and Japan Vice Minister for International Affairs, Ministry of Economy, Trade and Industry Nobuhiko Sasaki. The Social Security agreement will provide security to the Indians working in Japan and vice-versa. Between Japan and India, employees who are temporarily dispatched to India by Japanese companies and to Japan by Indian companies are obliged to join the pension system of both countries thus causing duplicable payments of social security contribution. The Japan-India Social Security Agreement is aimed to solve these problems. Upon the entry into force of this Agreement, those employees temporarily dispatched for a period of five years or less to the other country will, in principle, join only the pension system of the country from which employees are dispatched. It will also be able, based on the Agreement, to establish eligibility of receiving a pension in each country by totalizing the periods of the coverage in both countries. It is expected that the conclusion of this Agreement will reduce the burden imposed on companies and employees as well as further promote economic and human exchanges between Japan and India.